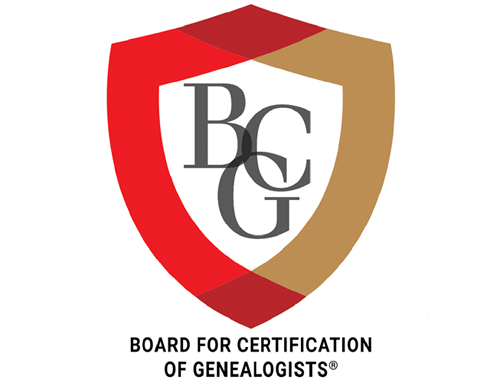 This post is part of an occasional series intended to educate and challenge BCG associates, aspirants, and the genealogical community at large. I promised last post to give examples of proof statements. Here are two. The first shows proof statements as sentences, the second as data items. Proof statements in a genealogical summary. Here each proof statement is comprised of an assertion and its related source citations, together proving the identity of Harriet and her husband. The sources are original and the context demonstrates “reasonably exhaustive research” in vital, church, and newspaper records. Two proof statements in this excerpt show the relationship of Harriet and Joseph to the parents of each. 1 England birth certificate, Harriett Jane Iddiols, 1842; General Register Office, London, image from Strand, vol. 1, p. 349. Also, Parish of St. Anne (Soho, Westminster, Middlesex), Baptisms, vol. 7 (1837–1853), p. 247, Harriett Jane Iddiols; microfilm 918,608, Family History Library (FHL), Salt Lake City, Utah. 2 “Died,” The Telegraph (Saint John, N.B. ), 5 April 1881, p. 3. 3 Saint John Co., marriage register, vol. F (1859–1863), p. 413, Williams–Iddiols; microfilm F16244, Provincial Archives of New Brunswick (PANB), Fredericton, N.B. Also, Saint John Co., marriage bond 1387 (1863), Williams–Iddiols; PANB microfilm F9093. 5 FamilySearch (http://familysearch.org : accessed 25 November 2014) > “Massachusetts, Town Clerk, Vital and Town Records, 1627–2001” > Suffolk > Boston > Deaths 1886–1887 > image 97 of 683, Joseph Williams. Also, “Deaths,” The Daily Sun (Saint John), 27 April 1886, p. 3. The author gratefully acknowledges Alison Hare, CG, for providing this example. Proof statements in a database. Here the proof statements are not sentences, but data items, a series of related proofs for the events of a woman’s life. Each is supported by at least one citation to a high quality source. Taken together they create context for evidence of this woman’s identity. Two items assert Philippina’s relationship to her father and her mother. Again, each is supported by direct evidence from original sources and some primary information. Using a relationship tag or fact allows us to identify all the sources that bear directly on proof of parentage. If our genealogy software does not provide such tags, we can create them. 1. Evangelische Kirche Kördorf, KB [Kirchenbuch, church register] 05, Taufen [baptisms], 1843, pp. 564–65, no. 42 [first of two], Philippine Magdalene Kayser; FHL microfilm 1,577,323, item 1. At the time of Philippina’s birth, Bremberg was in the Duchy of Nassau, now part of Germany. 2. Evangelische Kirche Kördorf, KB 05, Taufen [baptisms], 1843, pp. 564–65, no. 42; FHL microfilm 1,577,323, item 1. Also, Evangelische Kirche Kördorf, Konfirmationen [confirmations] 1818–1878, 1857, p. 120, no. 30, Philippine Magdalene Kayser; FHL microfilm 1,577,324, item 6. Also, “Aged Lady Dead; Mrs. Kicher, of Henderson Township, Expired Saturday,” Sykesville Post-Dispatch (Sykesville, Pennsylvania), 9 July 1909, p. 1, col. 4. “Kicher” reflects Philippina’s stepchildren’s abbreviation of their family name. 4. Evangelische Kirche Kördorf, Konfirmationen, 1857, p. 120, no. 3. 5. “Aged Lady Dead,” p. 1, col. 4. Also, 1880 U.S. Census, Jefferson County, Pennsylvania, population schedule, Henderson Township, ED 191, p. 17 (penned), dwelling/family 93, Frederic Kicherer household; NARA microfilm T9, roll 1136. 6. Pennsylvania Bureau of Vital Statistics, death certificate 61832 (1909), Bena Kicher; Pennsylvania State Archives, Harrisburg. Bena is a nickname for Philippina. Also, “Aged Lady Dead,” p. 1, col. 4. Did you notice how the proof statements in these examples comply with the Genealogical Proof Standard (except for resolution of conflicting evidence, as there is none)? Thomas W. Jones, Mastering Genealogical Proof (Arlington, Va.: National Genealogical Society, 2013), 84–86 and 177. Next time we’ll look at what our proof looks like when there is conflicting evidence.